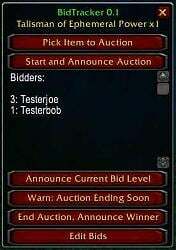 This AddOn is a simple DKP bidding mod, which lets you run a point auction for loot items. DISCLAIMER: This mod is only designed to run a simple auction, where players whisper you whole-number bids, which are not checked against any database. It was written for my guild, and therefore I will not be modifying it to work with other loot-distribution systems such as silent auction, one-bid-only auctions, fixed-price loot, etc. BidTracker runs a DKP/point auction for one or more items, accepting bids by whispers, and reporting the results to the group. BidTracker works in parties and raids. It will also work in /say if you are not in a group. To open BidTracker before starting an auction, type /bt or /bidtracker. To start an auction, first click "Pick Item to Auction." This opens a popup where you can shift-click an item link (currently only from chat). Enter the quantity of the item as well: BidTracker can handle auctions with multiples of an item, for example if Onyxia drops 2 of one class's headgear. 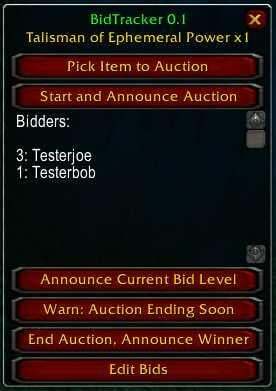 Then click "Start and Announce" to actually start the auction, and announce it in chat. Now BidTracker will listen to whispers to you. It will recognize numeric bids and add them to the displayed Bidders list. It will also whisper people back to acknowledge their bids. At any time you can click "Announce Current Bid Level" to announce the current winning bid(s). I chose to have a button for this instead of having it announce automatically when bids change, to reduce spamming during popular auctions. You can click "Warn: Auction Ending Soon" to announce the current top bid(s) along with a "final warning" note. At any time, bidders can declare they are done bidding, by whispering "out" or "done." They will show up in the summary as "Wikwocket: 5 (done)." Of course, they can still bid again, losing the "done" flag. This is just for notification convenience. When bidding is complete, click "End Auction" to end the auction and announce the winner(s) to chat. Winners will be mentioned with their winning bids, and will be individually whispered as well. If there is a tie for any item(s), anyone who has to roll will be announced (and whispered), along with the bid they all tied at. Items that were not bid for will be announced as "grats bank/DE." Winners/rollers will also be announced to the guild officer's channel. BidTracker should be able to handle even complex ties, for example an auction for 3x [Belt of Might] with bids of 7, 5, 3, 3, and 2. The mod will announce the winners (7 and 5) and the rollers (3 and 3). Eventually, I plan to have the mod also track the following rolls and announce the top roller(s). Finally, there is an "Edit Bids" button. This is in case someone overbids or types incorrectly. Clicking it will open a popup where you can type in commands to add, delete, or change bids, along with instructions. If you edit someone's bid they will get a whisper saying so. If you click on the "X" to close BidTracker, all data from the current auction will be discarded. So, if you have a problem with the mod, you can write down the current bids, then click "X" and complete the auction manually. - Updated for WoW 2.0. - Added colored status field to show auction status. - Added ability for bidders to declare they are done bidding. - Limited "Couldn't parse bid" messages to once per person per auction. - Changed whisper parser to ignore whispers from other instances of BidTracker. - Added tab cycling to "Pick Item" frame. I wanted to post here that BidTracker is not currently being updated. It should still work overall (probably until Cataclysm changes a lot of things). Unfortunately I have not been playing WoW as regularly and I do not have the time to update my AddOns. Is there a way to change the code of this mod to record or acknowledge negative dkp bids. Any help with this issue would be greatly appreciated. Last edited by Brakken : 02-19-09 at 06:55 PM. I am not sure what you mean. The highest bidder should always win an auction. Is this not happening? Unless you are referring to the type of system where the person with the highest DKP who expresses interest in an item always gets it. Systems like that are not really bidding systems at all, and so they are not the target market for this mod. They usually require online databases of who has how much DKP, and so are beyond the scope of a simple auction mod like this. I would like to ask, how can I make it so that 'High DKP' wins? I seem to remember it used to do that Pre-LK and havent been able to get it to work since. That was one of the things I liked alot. Would that be something I could change in a setting, or something more complex that would require a new version? Thank you again for your work and your response. Thanks for the suggestion, it is a good idea. I am not sure if I will be able to implement it though. Different people/guilds use different systems to determine how and when to auction drops from mobs: some people may auction all items, some may auction off-set items but use loot council for tier tokens, some may automatically shard some pieces or BoE's, etc. Some guilds assign loot all at once (multiple auctions by multiple officers), while some do the auctions in sequence. Due to these questions, and since my time is very limited, I think I might pass on this otherwise excellent idea. No worries, Thanks for the quick response. How about a mini map button then, lol. j/k, I'll tell them to just bind it to a key. Last edited by : 01-05-09 at 07:28 PM. I was wondering if there were a way to have the addon auto detect when a corpse is looted and have the bid window popup instead of typing /bt. Thanks for the wonderful addon, it has made bidding for loot alot easier for our guild. It's not a huge inconvienance to type that everytime, it would just make things run a bit smoother for our master looters. They have alot of info to type in for our dkp system and it would lessen the time spent waiting for them before we can move on in the raid. Then save the file and reload WoW. oops one more thing...lol can it also "report to guild"? The mod was written with DKP in find, but it just uses integral numbers. You could treat the numbers as DKP, gold, points, poker chips, or jelly beans if you like. The mod does refer to DKP in the UI and in its chat announcements though. If you like, you can open up the .lua file in a text editor and do a search/replace from "dkp" to "gold" or whatever you like. Hope this helps! do you have to be doing dkp? As in, can they whisper amount in gold, per say. Because I do like dkp, but I'd want to also use it for guild events, if that makes sense. It sounds very interesting, but do you have to be doing dkp? As in, can they whisper amount in gold, per say. Because I do like dkp, but I'd want to also use it for guild events, if that makes sense. (Like auctioning off plethora of gb items and suprise items etc). Last edited by Jeania : 10-31-08 at 04:55 PM. I looked at this, found the bug, and fixed it. Thanks for letting me know about it! Last edited by Wikwocket : 10-27-08 at 09:16 AM.